Pet Gecko Care - Learn Before Buying! Pet Gecko Care – Learn Before Buying! Before buying any pet, you should learn some of the facts about caring for that pet. You need to know what you’re getting into before you bring that living creature home. Below are some of the basics of pet gecko care you need to know. Understanding pet gecko care requirements ahead of time is important because they can live longer than many other pets. Some leopard geckos, for example, have lived up to 20 years as pet geckos. That’s a significant commitment for a pet owner. Breeding is another consideration. Many people who keep geckos as pets consider purchasing a breeding pair but this is not always the best choice. First, young males and females should not be housed together until they are of breeding age. 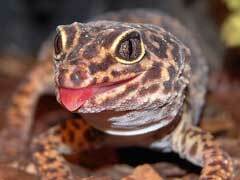 Second, breeding can be dangerous to the health of the female gecko. Breeding to have pet geckos for sale should be done only cautiously. Pet geckos should be fed at least twice a week but can be feed as frequently as every day. They do need live prey for their food which bothers some people. Feeding geckos does require purchasing crickets or mealworms and then gut-loading those insects (feeding them highly nutritious meals) for at least 24 hours. Adult geckos can also eat baby mice referred to as pinkies but only as treats because they contain more fat than crickets. When you are preparing a leopard gecko tank or a tank for any type of gecko, you must add some heating element to that tank so the reptile can stay warm. Unlike some reptiles who need heat lamps or basking rocks in their cages, geckos usually don’t. An under-the-tank heater can work just fine. In fact, you don’t want to add many lights to the tank because they can bother geckos who are nocturnal by nature. Another part of pet gecko care is adding appropriate shelters to the lizard’s tank. The shelters provide your pet with places to rest and to hide during the day. You can make your own from cottage cheese containers or cereal boxes or you can purchase some from the pet store. Make sure to spread them out around the cage. Keeping these issues regarding pet gecko care in mind you can ensure that you make the right decision when choosing these lizards for your pets.